This is the second attempt at a Tweet at a Time story that was made up during my hour on the plinth. I attempted to tell this story at the end of my hour. 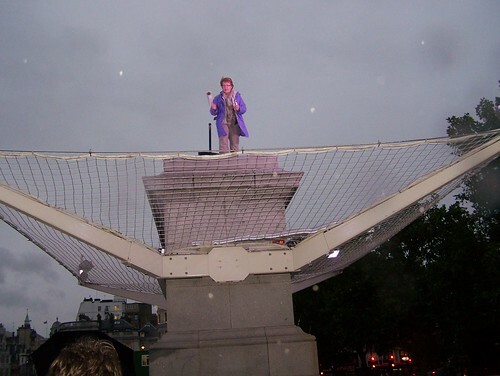 Once upon a time (@bilbobaggins2k ) there was a lonely plinth who lived in Trafalgar Square. For many years it was all alone…(@PlinthiPaul) …save for the odd bird hotel and disabled pregnant woman who dropped by to visit it. (@mittfh) Nobody cared for it, or even gave it more than a passing glance. Then one day (@notfortoffee)a swarm of bees came by (@bilbobaggins2k) chasing a guy called John who loved a fair maiden called Diana. (Me, putting this in later to make sense of the story) The handsome and intelligent Felix brought a fearsome demon called ‘cherrypicker’ to the square terrifying the plinth and astonishing John so much he even forgot his love for Diana momentarily. The bees flew off hastily. (@bilbobaggins2k) They were fearful of the mighty demon ‘cherrypicker’ who would storm the square every hour taking away any new friend the plinth had made which made the plinth feel very sad as this was not a way to form a lasting relationship (@notfortoffee) One day though, handsome and intelligent Felix brought a girl to the plinth who could summon dragons. And the dragon destroyed ‘cherrypicker’ with his fiery breath! (@bilbobaggins2k) Which meant the great plinther @thurtinkle could remain upon the plinth for all eternity (@notfortoffee) which made the plinth very happy, @thurtinkle not so much bc he had to stay there with John and the ghost of Diana! (@notfortoffee) Handsome and intelligent @oneandotherweb droid Felix married the girl who could summon dragons & was able to escape Trafalgar Square (@bilbobaggins2k) and they all lived happily ever after…(@PlinthiPaul) The lonely plinth fell over and crushed John. Previous First Tweet at a time Story Next Comment at a time story.